You've got the songs, so now all you need are the people to help you bring them to life. You know that finding the right band members is crucial to your success, but where do you begin your search? These tips will point you in the right direction. Where do music types like to gather? The record shop, of course! Or the instrument shop or another music-related shop. Most of these places, especially the independently-owned ones, will have message boards where you can advertise for band members. Be sure to put a little bit about your music on the advertisement, or at least some info about bands that you like, and don't forget to include some way for interested people to contact you. Asking the staff of these stores is another way to find people looking for a band. Websites like Craigslist are filled with ads from people looking for a band to join. Browse through the lists of musicians in your area who are interested in finding a band with whom to play, and place your ad seeking band members. Include the same information you would on an advertisement on the record store message board. You can also visit forums for musicians to get the word out. Put a call into the recording studios and rehearsal spaces in your area and let the people there know you are looking for musicians. See if they have space where you can come by and post an advertisement for your band. The staff at these places know who is playing with which band and who is looking for a new gig, and they can be a great resource for you. 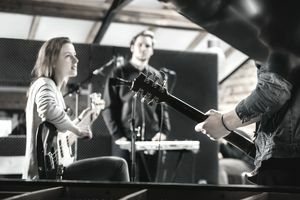 Even if you haven't used the studio or the rehearsal space before, don't shy away from approaching them in your search for your band members. Stick advertisements up anywhere you think like-minded musicians may frequent. Coffee shops, bookshops, college campuses, clubs, and venues — the key is to let people know you are looking. Get the word out there! Consider setting up a special email account just for people to use to respond to your advertisements, especially if you plan on putting up ads all over in town in non-music related places, so you can avoid that guy who pulled your contact info off your ad on the coffee shop wall to try and sell you an insurance policy. When you advertise, be as specific as possible about the kind of music you want to play. It's a waste of time for the jam band guy to show up at the metal band audition. You want people in your band with whom you share a lot of musical interests, so you're more likely to have the same "vision." Take the time to find bandmates who can not only play but who you genuinely like. Remember, if all goes well, you could be spending quite a lot of time with these people. No one likes spending 12 hours crammed in a van with someone they can't stand. Your shows will be better if everyone likes and respects each other. Be clear about your expectations for a new band member. How many practices a week do you plan to have? Will everyone get to have some creative input, or is there only one songwriter? It is very important to figure these things out in advance. Also, if you're serious about making a go of things with the band, let people know up front that you expect a certain amount of professionalism. Tell people you expect band members to get to the show or practice on time, well-rehearsed, and ready to play. Talk about the money up front. If there will be band related expenses, like traveling to shows, now is the time work out who pays for what.